It hasn’t been used in 30 years to commute a death sentence, but executive clemency will still keep more than 100 Death Row inmates from being quickly executed under a law signed in June by Gov. Rick Scott. Scott on Friday received a list of 132 convicts certified by Florida Supreme Court Clerk Thomas Hall as being at least partially “warrant ready” under the requirements of the “Timely Justice Act,” which was passed by the Republican-dominated Legislature this spring. Some of the state’s most notorious killers are on the list, including Juan Chavez, convicted of killing 9-year-old Jimmy Ryce in Redland 18 years ago. But only after clemency is complete does the 30-day trigger for Scott to sign a death warrant begin under the new law, and just a fraction of those on the list — between 10 and 20 — are in any stage of the clemency process. And nobody on the list has yet reached the threshold for an execution order because, according to Scott’s lawyers, executive clemency isn’t finalized until the governor actually signs a death warrant. That means that the new law will not spark a flurry of executions, perhaps dashing some lawmakers’ expectations. “Most of the cases received from the Supreme Court clerk, pursuant to state law, have not yet begun clemency review. Therefore, only a small fraction of these cases will be eligible for the issuance of a death warrant any time soon,” Scott’s general counsel Pete Antonacci said Thursday. Because executive clemency is confidential, there is no way to determine who on the list will be among the first death warrants issued. Under the new law, the Supreme Court clerk must certify to the governor a list of Death Row inmates whose initial state and federal appeals have been exhausted. According to Supreme Court Clerk Hall, 132 meet those requirements. The law orders the governor to sign death warrants for the condemned on the list within 30 days and direct the warden to schedule their executions within 180 days — but only once the executive clemency process has been completed. Since Scott’s lawyers say that does not happen until the governor deems clemency is finalized, it is unclear exactly what impact the portions of the new law dealing with the timing of executions will have. “With that broad of an interpretation, one would wonder why the governor signed the bill in the first place. It would seem to be nothing more than kowtowing to his constituency without any substance,” said Stephen Harper, a Florida International University law professor who teaches a course on the death penalty, runs the school’s death penalty clinic and has represented numerous clients charged with capital crimes. It has been three decades since a Death Row inmate has been granted clemency. In 1983, then-Gov. Bob Graham and the clemency board commuted the death sentence of Jesse Ray Rutledge, convicted of killing a woman and child in Hawthorne. Harper also said the Legislature may interpret the law differently than Scott’s lawyers. “This could create an unnecessary constitutional mess between the governor, the Legislature and the Florida Supreme Court as it’s being litigated right now. And I have concern that the governor’s counsel’s interpretation of this law may not be accurate,” he said. More than 150 lawyers representing Death Row inmates are challenging the constitutionality of the new law with a case before the Florida Supreme Court. The lawyers believe the “Timely Justice Act” violates the separation of powers as well as convicts’ constitutional rights to due process and equal protection. 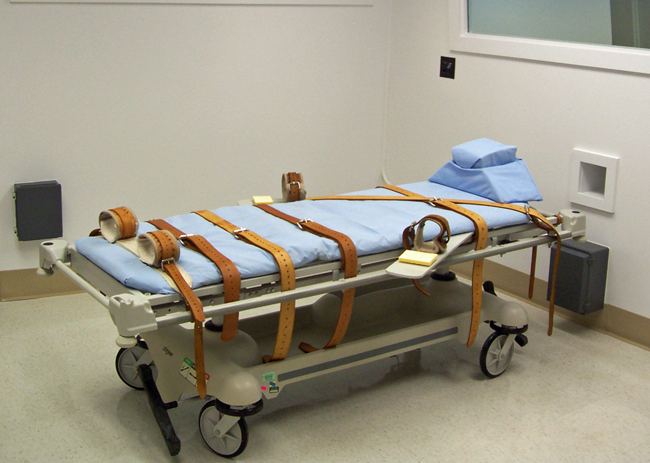 After the law was passed, Scott’s office launched a public relations crusade insisting that the Timely Justice Act would not speed up executions. But lawmakers who sponsored the legislation said it was intended to shorten the length of time between conviction and execution, which now lasts on average more than two decades. “Several on death row need to start picking out their last meals,” House sponsor Matt Gaetz, R-Fort Walton Beach, posted on Twitter in June after Scott signed the bill. The list of 132 potentially warrant-eligible inmates makes up more than one-quarter of the 405 prisoners now on Florida’s Death Row. Some of the state’s most infamous killers are on it. Alphonso Cave, 53, has been on Death Row for three decades for his part in the 1982 murder of Frances Julia Slater, the 18-year-old step-daughter of Ralph Evinrude, the founder of the marine motor company that bears his name, and actress Frances Langford. Slater was abducted at gunpoint from a Stuart convenience store and stabbed and shot to death in a field 13 miles away. Cave and the three others divided the $143 they got in the robbery as they drove home. But many on the list, including Chavez, are in the midst of what are known as “successive” appeals, something not considered by the new law but noted by Hall in his letter to Scott on Friday. Successive appeals can be filed if new evidence, such as DNA, is found, or if the state or U.S. Supreme Court issue decisions on death penalty cases that may have some bearing, such as a ruling that juveniles cannot be sentenced to death. In what is considered a precedent-setting order, the Florida Supreme Court stayed the execution of Paul Beasley Johnson in 2009 to consider “significant issues” raised in that appeal. Then-Gov. Charlie Crist signed the death warrant in that case. Scott’s legal staff said the governor does not intend to sign death warrants while successive appeals are pending in keeping with other governors. Marty McClain was one of Johnson’s lawyers and represents several Death Row prisoners, including Sonny Boy Oats, who is on the list. McClain is also one of the lawyers challenging the law. Attorneys for Oats, 53, have long contested the mental competency of their client, who has been on Death Row for more than 30 years. Oats was sentenced to death in 1981 for the 1979 killing of 50-year-old Martel convenience store clerk Jeanette Lola Dyers. He also received a life sentence for a separate attempted murder charge in the shooting of an Ocala liquor store clerk. Oats’ successive appeal dealing with his mental competency is still pending before the court. “My expectation was that they wouldn’t send the list given that we were claiming that it was unconstitutional for the Legislature to be directing somebody in the judicial branch, the clerk, to do something. And we also wanted to have the right to see if our client was being listed and explain why he shouldn’t be or that there wasn’t something pending. I’m kind of surprised by their action,” McClain said. I am hoping for a day when Florida does not have a death penalty at all. I’m constantly baffled at the people and media that side with killers over innocent victims. It’s not about siding with killers but state approved killing isn’t the answer. Suspects have more rights these days than the victims and police, what a shame! I think liberal America needs to realize what there doing with all these B-S lawsuits and complaining, because once the genie is out of the bottle there is no going back! You mean like the execution of the innocent? I’ve worked in the criminal justice system for over 13 years and I’ve seen more police corruption and incompetence, unethical or indifferent prosecution, and judicial bias than you can shake a stick at. So I guess MURDER pays in Florida !!! these animals have already lived to long! should take no more than 5 years….